We have three Macs at home, which run an assortment of cloud-backup and synchronization apps—including Dropbox, CrashPlan, BitTorrent Sync and Arq. Whenever any one, or combination of, these apps saturates the ADSL upload bandwidth, downloading then becomes very difficult. And that presents a big problem when trying to do things like watch content on iTunes, or have a conversation over Skype. They all provide for bandwidth limitation through configuration. That doesn’t help, though, when you have multiple apps trying to upload at once. And who really wants to limit upload bandwidth during the 95% of the day when it wouldn’t matter anyway, just to address the 5% of the time when it’s needed? Some provide for automatic bandwidth reduction when detecting that the network—on the given computer—is busy. But this doesn’t help when you have the apps running on multiple machines on the network. All provide for manual pausing. Only Arq provides a means of pausing through scripting (or via a command-line interface); the rest require manually clicking their menu-bar icons. Only Arq and CrashPlan allow you to specify the amount of time to pause; for the others, you have to remember to unpause them. And BitTorrent Sync’s menubar icon doesn’t even have a “paused” state (like Dropbox’s), which nearly ensures that an unfortunate event—like realizing the file you’re working on isn’t up to date—will be the thing that reminds you that it’s not running. All such apps provided a means of scripted pausing. That way, using my iPhone while sitting on the couch, I could connect to Keyboard Maestro and run a macro that would pause every app on every machine on the network. All such apps provided timed pauses. That way, I wouldn’t have to remember to unpause them. And for those that don’t provide timed pauses, for goodness sake, at least provide a paused state of your menu-bar icon. 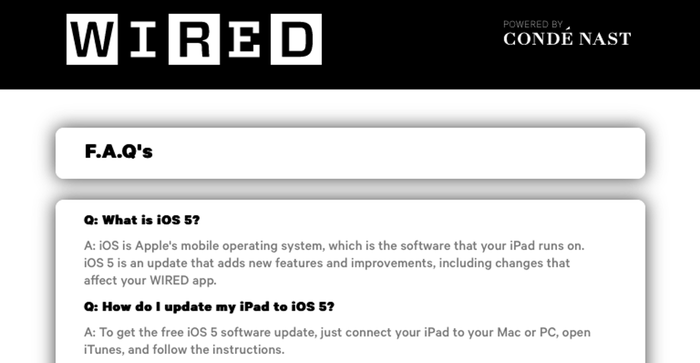 This article is about a frustrating experience with the WIRED Magazine iPad app, by Conde Nast. I have an active subscription to WIRED Magazine on the iPad, valid through July 2014. After a recent iOS update, I found that most of my subscribed magazines, including WIRED, were missing from the Newsstand app. So I began looking for a way to tell the app that I am a current subscriber. The app has five sections: Library, Store, My Account, FAQ and Video. I started by visiting the “My Account” area. The “All Access” and “Complete Account Setup” would seem like candidates, but after poking around in those sections I discovered they are only relevant to print subscribers. “What is iOS 5?”, “How do I update to iOS 5?” Seriously, this from a magazine positioned to be on the cutting edge of technology? We’re long past iOS 5, guys. So it’s back to the Store screen. The current issue displayed two options — “Purchase for $4.99” or “Subscribe”. I decided to tap the “Subscribe” button, and was asked to choose between a monthly subscription for $1.99 or a yearly subscription for $19.99. I tapped the yearly subscription option, expecting that when the app submitted the purchase request to Apple, it would be told that I’m already a subscriber. You are already subscribed to WIRED Magazine, through July 2014. Except for one problem—all the magazine issues were still listed as purchasable, not downloadable. So even after confirming that I’m an active subscriber, the app still didn’t update its state to reflect that. But that wasn’t it either. After some fumbling around, I discovered that’s related to your WIRED website account, and unrelated to your app subscription. So I tapped the “Purchase” button on the November issue and…got a confirmation that I’ve just spent $4.99. Heavy sigh. For a moment I almost didn’t believe it, but then got the Growl notification as Mail.app announced the incoming iTunes purchase receipt email. Unwilling to believe there’s no way to tell this app that I’m subscribed, I finally noticed the gear icon in the upper right corner of the Library screen. For whatever reason, I had previously discounted this as an option. I guess my subconscious just assumed that given the presence of a “Sign-in” service opposite this gear, that the gear section wouldn’t contain account-related services. But lo and behold, under the gear menu I found an option called, “Restore Purchases”, which when tapped finally changed the state of the app to reflect my active subscription, allowing me to download issues without purchase. They do that for print subscribers—i.e. they have very prevalent messages under the “My Account” area communicating, “Already a print subscriber? Click here for iPad access.”—so why not an equally-prevalent service for iPad-only subscribers? I ended up making an unfortunate $4.99 purchase, and wasting a lot of time unnecessarily, due to what, in my opinion, is unthoughtful interaction design. I emailed iTunes, explaining what happened and requesting a refund of the $4.99 purchase. Although they did grant a refund, their reply was almost as disappointing as the experience with WIRED. First, they communicate appreciation for me having contacted them, and confirming an understanding that I’ve asked for assistance with an “accidental” in-app purchase. Then, they communicate how much pleasure it gives them to have the opportunity to help me and proceed to reference some knowledge-base articles explaining what in-app purchases are, and how to disable them in my apps—all of which suggests they didn’t even bother trying to understand what actually happened. As a Mac user for the past 27 years, I’ve had little exposure to Microsoft Windows. My assumption, though, is that the usability of the Windows operating system has been improving over the years. Look like I may have been wrong. Did the designer of this screen not realize that that sentence could be truthfully said about any installation—including those that did not install correctly, but also those that did! Please, if you’re going to show the user a message like this, at least give them some indication why they’re seeing it—for example, did the installer experience some errors during the install process? OK, so what are the options I’m provided for responding? 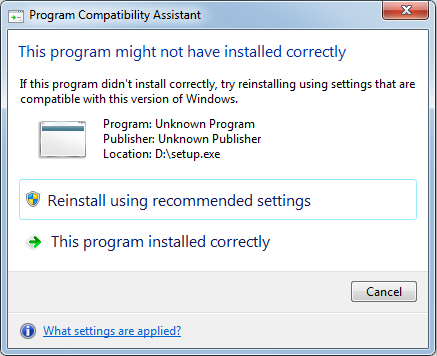 “This program installed correctly.” How the heck am I supposed to know whether the programmed installed correctly, if the installation process has just finished, and I haven’t had a chance to open the program yet? I can “Cancel”. What does that mean, that my installation process will be reverted? How does this differ from pressing the “X”? p>Under the circumstances, I figured I’d better go with the “Reinstall…” option, which, as I nearly expected, resulted in getting to see this exact same window a second time—after which I just pressed, “This program installed correctly” and hoped for the best. Hey, go make the site look like the other sites out there. You know, BIG and spacey, like Apple! Web 2.0, right? And throw in some icons and progress bars. And gradients. Oh, and tabs! 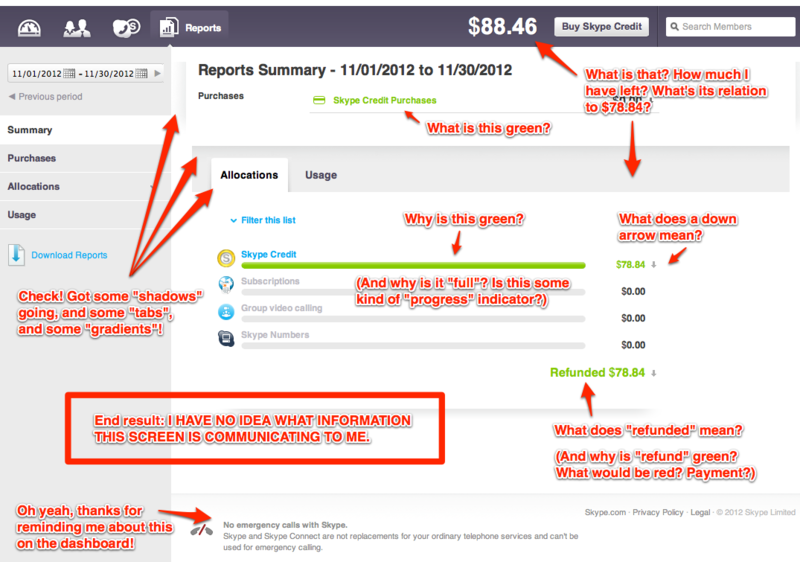 Here’s the awful mess of a result of visual design sans usability design. This is the “dashboard” of the Skype Manager. I have absolutely no idea what information it’s trying to communicate to me. 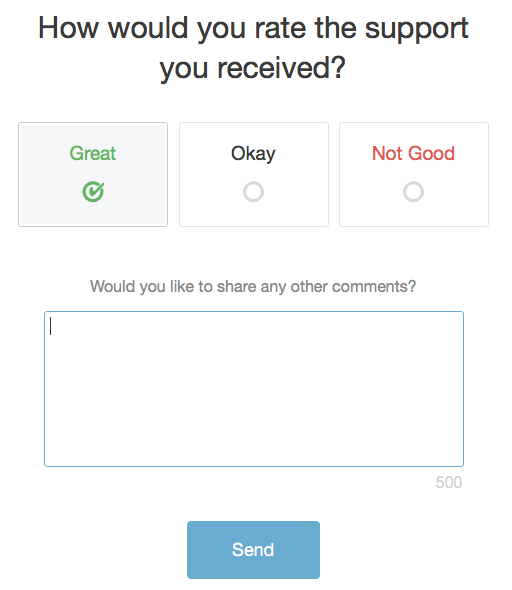 But hey, the manager at Skype can check off, “Have a Dashboard, like everybody else!” off his list. When designing the purchase experience for Money for Something, we wanted to make it as easy as possible to buy the book. With that objective, we integrated Stripe’s technology — the customer enters their name, credit card details, and clicks “Place Order”. A moment later, they have the book. Even though Stripe does the processing on their servers, the experience is fully integrated within our own site. It couldn’t be more elegant or efficient. Contrast that with the experience someone living in Europe typically has when buying something online from a European organization. This morning, I wanted to buy airline tickets from AirFrance.es, and pay with the business credit card issued by my German bank. At checkout, I’m asked to enter my name, credit card details and billing address. A stern warning advises that if the data doesn’t precisely match the billing address of the credit card, the transaction will be denied. Already setting a dire tone, and raising questions. Should I include the hyphen in the street name, “Robert-Bosch”? Should I spell out “Strasse” or leave it just “Str.”? I take a guess and hope for the best. Clicking “Pay”, I watched the browser cycle through various URLs on different domains before landing on a blank screen with an iFrame inserted in the middle. The content looks like something out of a 1999 HTML web design book and it’s in German, rather than the Spanish I was seeing on the AirFrance site. In fact, it’s completely bank-branded. I’m asked to enter my MasterCard “SecureCode™”? Off I go to Yojimbo, hunt around for my MasterCard note, decrypt, and thank god, there it is, my MasterCard SecureCode. Yes! Of course it’s expired. What self-respecting SecureCode doesn’t expire? Right. How do I create a new SecureCode? The message gives no indication. Calling my German bank, I wait on hold for a while as they look for somebody that speaks English. That person informs me that to create a new SecureCode, I need to start the purchase process again, but this time, click “Forgot SecureCode” on the confirmation screen. Yes, that’s how you create a new SecureCode; you click “Forgot SecureCode”. So it ended up taking me five minutes to configure my flight, and 45 minutes to pay for it. Awful. Yesterday, I visited MasMusculo.com to purchase some multi-vitamins. Again, it took about five minutes to find my vitamins, which came to a total of 27 Euros. Once again, though, the purchase workflow was interrupted by an awkward visit to some unrelated URL, where I was shown a blank screen with an iFrame containing content from my personal credit card provider, Deutsche Bank. On this screen, I’m asked to enter my personal PIN, and the code from coordinate “G5” on my SecureCard™. What’s a SecureCard™? This is a card containing a grid of numbers, identified by alpha columns and numeric rows, one of which you’re randomly asked for (in my case, “G5”). Sigh. Off I go hunting for my SecureCard™. Of course, you can’t just type in your PIN and data from the SecureCard. No, somebody could have installed a keylogger on your computer, and over time, collect all the data from your SecureCard™ and then fraudulently buy vitamins! To enter your PIN and SecureCard™ data, I’m shown a virtual keyboard with the key locations randomly distributed, i.e. it’s not 1, 2, 3… but rather something like 6, 3, 9, 2. Your data did not match, or there was a system error. Please contact the System Administrator. Three more tries, and they all fail. I call Deutshe Bank and can’t get through to an operator because “Your PIN number is incorrect.” Finally, after jumping through some second-level security questions, I get to an operator who tells me my PIN is in fact correct, and the SecureCard™ issue number is correct. So they have no idea why the system is failing, and they don’t know who my System Administrator might be. So what do I do? I go to Amazon.co.uk and purchase the same vitamins from the United Kingdom for 45 Euros (including shipping). I pay an additional 60% on my purchase, to get one-click convenience, and save additional lost time. Europe — the land of ancient cathedrals and still not-quite-sure about this whole credit card thing — is ripe for company like Stripe, Square, PayPal or somebody else in the payment space to come in and make life easier. 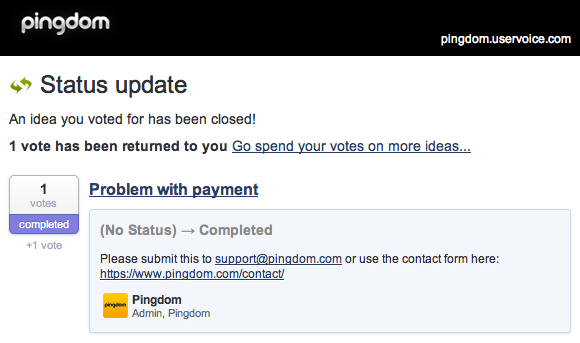 Pingdom is a great service, and we use them to monitor all of our sites and apps, but I gotta say — they just sent the strangest failed payment notification ever. It’s begins by letting me know that, “an idea I voted on has been closed.” An idea that I voted on. What on earth does that mean? Doesn’t matter, really; I’m encouraged to go spend some more votes! On more ideas! Something’s been completed. What has been completed? “(No Status)”, that’s what. 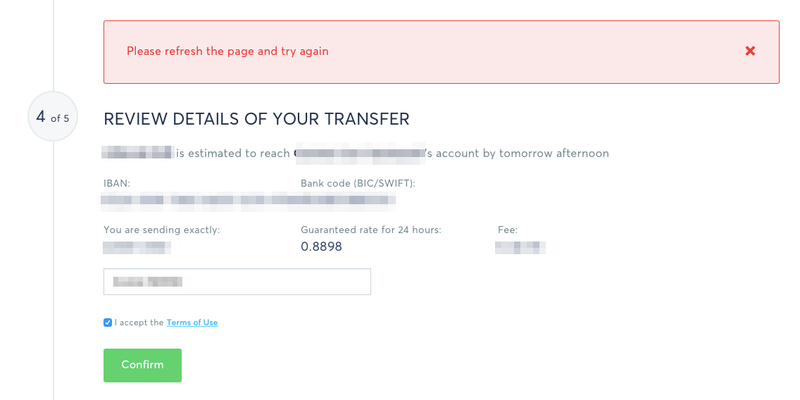 I just confirmed with my credit card provider that no failed charge attempt happened, so let’s just chalk this one up to them, hopefully, beta testing something? Earlier this week I completed a trip that I’d earlier reserved with Booking.com. Today, a fews days later, I received this innocent-looking email from Booking, asking me if I’d be so kind as to answer four questions about my trip. Four questions. That’s all. Why not? So, I clicked the link. Would you like to know what four questions looks like? More like nearly 16 to me. 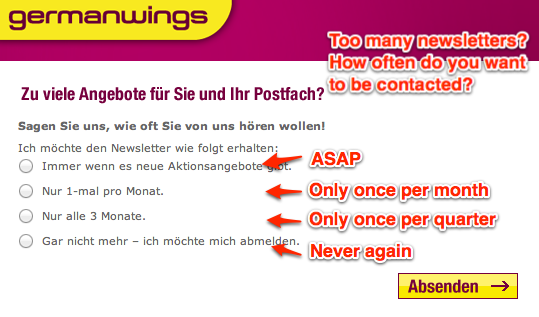 Thanks for a great user experience, Booking.com. Booking tweeted to me that they plan to address this. Let’s check back next year. Whenever we travel, it’s almost always my wife who does the online research, and settles on a particular flight, hotel and/or rental car. She then emails me URLs, with a request to make the bookings. In my experience, those URLs — which usually span at least four lines in the email — almost never lead to what my wife had configured and thought she was sending to me. Just today, a rental car she found in Holland, showed up as a car in Albania for me! In the end, we always end up sitting down and doing both the research and booking together. I imagine this scenario is not uncommon, where one person does the research, and another does the booking. It would be great if companies operating these websites foresaw this workflow, and ensured that researched configurations can accurately be passed to another person for booking.